With spring’s arrival and summer fast approaching, it’s time to start thinking about preparing your outdoor space for the warmer weather! There are many ways to achieve celebrity style living in your own backyard! 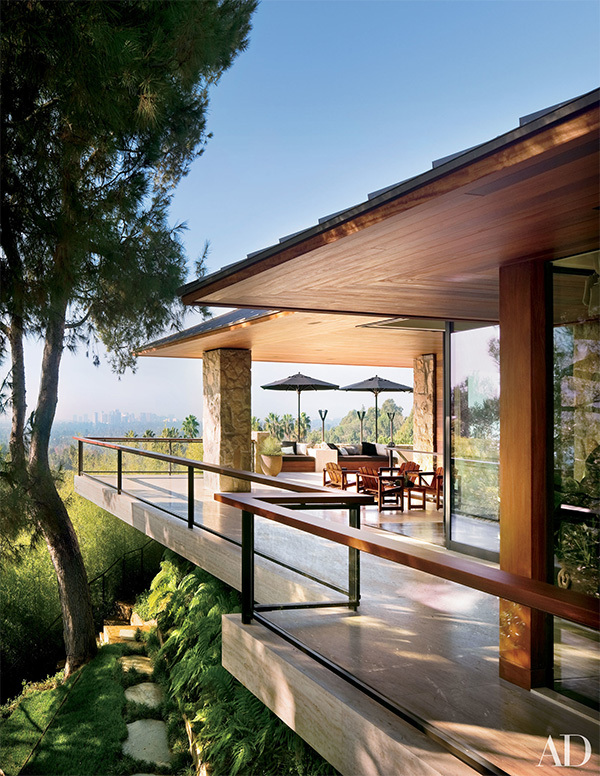 Jennifer Aniston’s gorgeous back deck, pictured above, is giving us major back deck inspiration. Achieving such a luxurious yet serene backyard retreat is completely attainable with Kebony’s wood products for decking, siding, and more! The first step to take in revamping your outdoor space is the base, the deck. It’s important if you are building or renovating a deck to choose a wood that is durable and made to last. 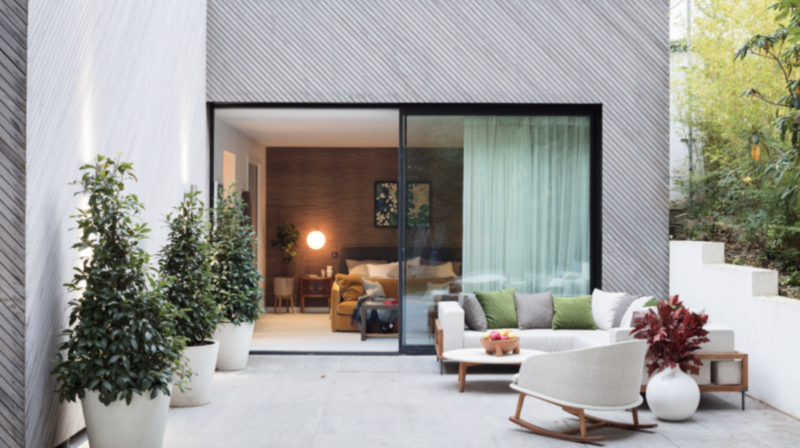 Norwegian-based company Kebony is a great source for outdoor timber. Kebony specializes in producing enhanced wood of a superior quality that is both environmentally friendly and cost-effective. Your outdoor deck is an extension of your interior design. Make your deck both beautiful and functional, like in the photo above, which showcases a Kebony wood deck from a home in Germany. The photo below is gorgeous example of how to create a seamless flow between indoor and outdoor living also showcasing Kebony. The stunning exterior walls shown are covered in Kebony wood. 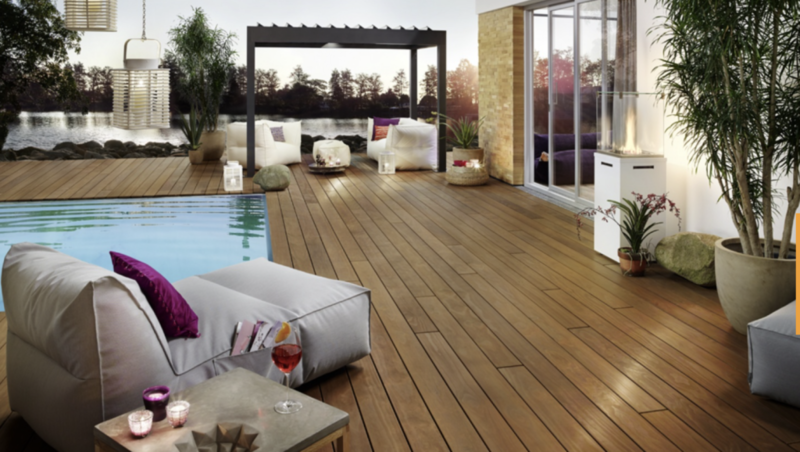 Why stop at just outdoor furniture when curating your outdoor deck… add a touch of luxury! 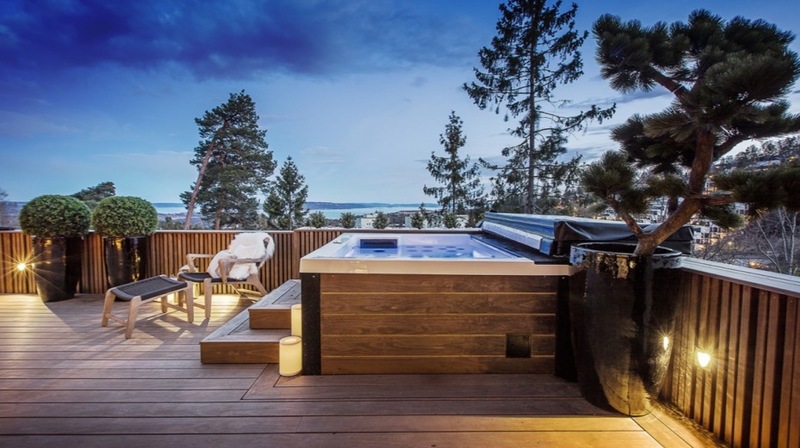 If you really want to elevate your outdoor space, why not add a hot tub? What better way to transform your backyard into a relaxing oasis than adding a hot tub to your deck. There are many things to consider when you’re getting ready to install a hot tub in your backyard. What type of tub do you want? Where do you want the hot tub? Safety factors must also be considered as well in the installation process. But don’t worry, we have simplified the process. Where to Put the Hot Tub? Consider where in your backyard or on your current deck you want to place your hot tub. Although there are logistics that factor into a location of a hot tub, like access to water and electricity or room for maintenance and repairs, don’t forget to have fun with it! Do you have a beautiful garden area you want to overlook? Do you have a pool you want to add the hot tub on to? Be creative and have fun with it! Selecting your hot tub can be an exciting but overwhelming process. There are all sorts of shapes, sizes, and design options to keep in mind. Consider what you want out of your hot tub and how you want it set up on your deck. Would you like it to be simple and strictly functional, or would you like it to be a main design element of your outdoor space? Below I’ve listed a few different options to consider, which can all be built around a custom deck. The plexiglass design is perfect for anyone looking to achieve a contemporary look for their hot tub. This is a great option to consider when adding a hot tub to an already-existing deck. The plexiglass hot tub is ultra-chic and sure to make a modern statement. A sunken hot tub is another great option for a contemporary, subtle and fluid addition to a deck. A sunken tub can also be added to an already-existing deck. 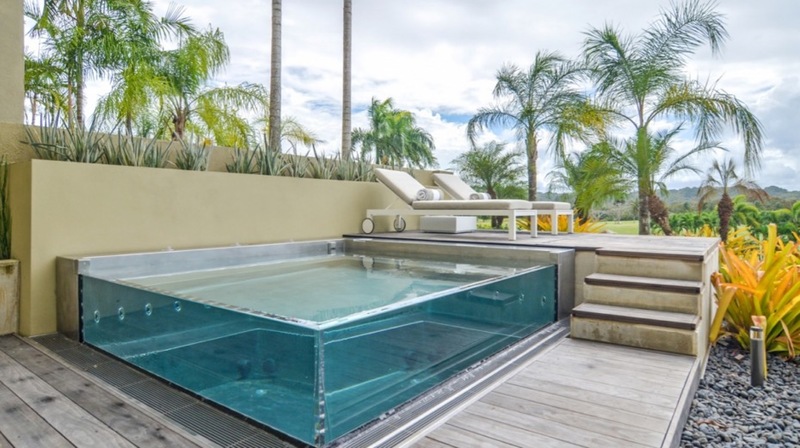 Installing a sunken hot tub is minimalist, yet function-focused design option. Keep in mind, a sunken hot tub could have some potential safety concerns for children. If you want to add a hot tub to an already existing deck, a built-in hot tub is a great option. They can also be added to a deck that’s in the construction process. This is a great option so you can see a view from the hot tub over a deck’s railing. 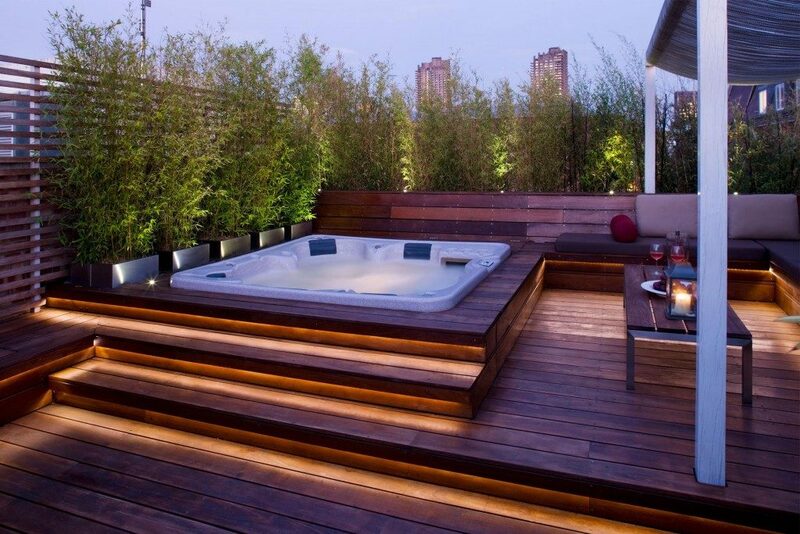 The tub can also be surrounded with the same wood as the deck to make it blend in with the environment. This is also the safest option for children. You’ll also need to decide if you want a jetted tub or more of a spa-type tub for your back deck. Creating the deck of your dreams is all about the detailing you select! If you want to make an architectural statement with your deck, or are just looking for some shade, try adding a pergola. They are also a great way to add lush greenery to a contemporary deck, like the photo shown above. Either way, pergolas are great to create an outdoor seating area like shown here. Pergolas can protect you from harmful UV rays, or provide shade to make blazing summer days outdoors more enjoyable. Wood from Kebony would be the perfect material to construct a pergola because it’s durable against the elements while remaining environmentally friendly. With warmer weather right around the corner, now is the perfect time to start constructing your outdoor oasis. Don’t forget to start with a durable wood for your deck like Kebony’s durable woods. You won’t need to blow your budget on an extravagant penthouse when you can have the same deluxe experience in your own backyard. Hot tubs are a totally realistic way to create an ultra luxurious spa-like environment in your own home. 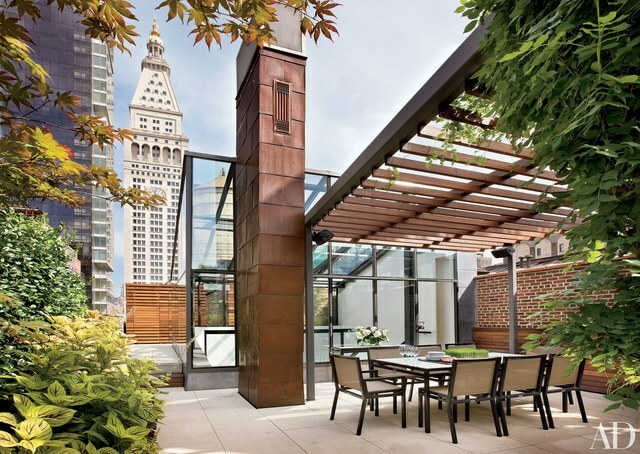 Or if you are aiming for a strong architectural statement, add a pergola. With these outdoor additions you’ll be living like a celebrity in your own home all summer long. Visit Kebony.com to learn more about the potential available for your home’s outdoor space with Kebony wood products.